If any of you are using the Microsoft System Centre Capacity Planner you might like to know about a bug I discovered yesterday. The bug is that when you edit the model, modify the latency of the site to site connections and then save the model, after you re-open the model the latencies are reset to 10ms. I posted the bug to the SCCP managed forum and I would like to compliment Jonathan Hardwick from Microsoft on his prompt response. He has confirmed the problem as a bug. So hopefully a patch or release will be available soon to fix the problem. I just spotted this spreadsheet that Mark Arend has posted. The Sharepoint 2007 permissions matrix is a great reference of the out of box permissions and how they map to the default groups. The other great reference is on the sharepoint solutions page. This is a collection of visio diagrams on all sorts of sharepoint topics. Search for the diagram on application security. Just stumbled across this on a Google search. Adobe Labs have a pre-release of how to support Adobe Reader v8.1 ifilter on 64bit sharepoint. I’ll admit that I haven’t tested this yet and it involves a 64bit ‘thunking’ layer. In the past I have seen some instructions on to use this technique to ‘hack’ together a custom 32bit ifilter handler onto a 64bit system. The main significance of this is that currently the only cleanest way of supporting pdf indexing on sharepoint 64bit platforms is to use foxit pdf ifilter. However this is commercial software that is priced based on the number of CPU cores. (As at 25JAN2008 this was “License cost for each server with up to two CPU cores is $329.99. Each additional CPU core costs $129.99.”) Now with most production servers these days being dual quad core processors (ie 8 processing cores) This would be US$1109.93 for each production server. Congrats does go to foxit for seeing a large hole left in the market by Adobe being so slow to support the 64bit platform and providing a solution. The other comment worth making is that the foxit 64bit ifilter may be coded natively in 64bit but I’m not sure of this. Whereas the Adobe solution is taking the existing 32bit ifilter in wrapping it into 64bit which does involve a processing cost overhead. If you had a large index with lots pdf documents then going for a native pdf ifilter could bring a significant performance difference. ‘cwhite’ has just posted on the sharepoint ‘from the field’ blog on a hotfix release to fix timer job issues. This has also been known as the ‘timer job shocker’. Initially I read some reports that it might be due to a security update to the .NET framework but it re-appeared for me. This one has been has been a tough one to track down so I’m glad to see that a hotfix has been released. In the application event log you will see events for 7076, 6398, 6432 and for me I also saw 6482. I’ll copy and paste the full events from my test server below. The KB article is here. The anonying thing about this KB article is that it is categorised as only applying to IIS and not sharepoint even though the big driver to fix this seem to have been MOSS related. That means that it would be difficult to find this KB article if you are restricting your KB searches by product. The Execute method of job definition Microsoft.Office.Server.Administration.ApplicationServerAdministrationServiceJob (ID 9668b02b-5f13-4963-bf0b-181c81272dea) threw an exception. More information is included below. Application Server Administration job failed for service instance Microsoft.Office.Server.Search.Administration.SearchAdminSharedWebServiceInstance (5e5393a6-039a-4896-a727-04818d85b326). An exception occurred while executing the Application Server Administration job. I’m on sharepoint designer training this week and getting up to speed to sharepoint publishing and WCM. I spotted another bizarre default behaviour in sharepoint yesterday. If you have a publishing site and you apply individual permissions to pages (also known as fine grained permissions), which is not beyond the realm of possibility on an intranet or similar website by default these pages will not be included in the search results. Go to the site settings for the site and from the ‘Site Administration’ column select ‘Search Visibility’. 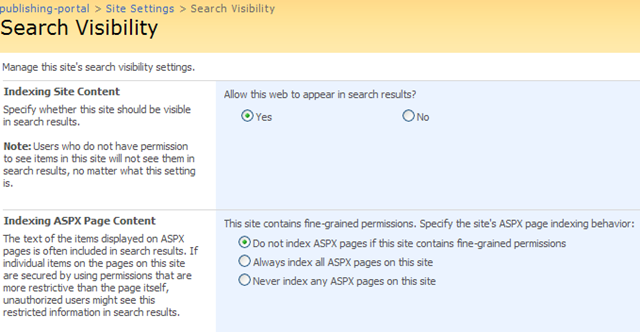 You will notice that aspx pages by default are not indexed if they have fine grained permissions. This just seems to be a bizarre default setting. Given that search results are security trimmed why is the default behaviour not to index all aspx pages? Anyhow change the setting to ‘Always index all aspx pages on this site’ and they will be indexed. The nice thing on the screen above is that the sentence above the radio buttons will indicate if your site has fine grained permissions. Well it’s finally been released, SP1 for MOSS / Sharepoint 2007. The best place to start is the technet resource centre. Looks like there a few ‘gotchas’! Watch out for the known issue of killing the registry settings for the foxit pdf ifilter if you are using that. Looks like go slow, take care and test, test, test, for applying this SP.